Ellen Catherine (Krentz) Pennekamp was called home to heaven by our loving God on April 9, 2019. Ellen was born on Dec. 24, 1925, in Laporte, Indiana, to Erich and Callie (Meuschke) Krentz. 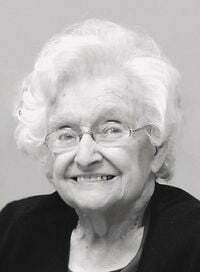 She attended Valparaiso University, where she graduated with a Bachelors Degree in Social Work in 1948. Ellen and Eugene Pennekamp were married on June 18, 1949, at St. Johns Lutheran Church in LaPorte. In the years that followed, God blessed them with six children. Ellen graciously served as a pastors wife in Lutheran congregations in Missouri, Arkansas, and Kansas. She dearly loved Jesus and shared His love freely with everyone through her wonderful smile, kind nature and unconditional, unselfish love. She was faithful in prayer and Bible study and loved to sing. She was a master in the kitchen and was especially known for her coffeecake, rolls, pies and applesauce, which she loved to share with family and friends. Her happiest times were family get togethers, even if all she did was watch the fun. Ellen is survived by: children, Paul (Linda) Pennekamp, Owasso, Oklahoma, Deborah (John) Matthew, Wichita, Kansas, Lois (Mike) Farrell, Atchison, Rebecca (Dean) Aurich, Waverly, Minnesota, and Sarah (Mike) Accorsi, Mansfield Center, Connecticut; 17 grandchildren and 20 great-grandchildren; sister, Annette (Richard) Larson. She was preceded in death by: her husband, Gene; son, John; brothers, Carl and Paul; and sisters, Evelyn and Emily. A funeral service will be held at 11 a.m. Monday, April 15, 2019, at Trinity Lutheran Church, Girard, Kansas, with the Rev. Mark Wenzelburger officiating. Burial will follow at Garden of Memories Cemetery, Pittsburg, Kansas. The family will greet friends beginning at 9:30 a.m. at the church. Memorials may be sent to Lutheran World Relief, P.O. Box 17061, Baltimore, MD 21298-9832. Friends may also leave condolences online at www.brennermortuary.com. Arrangements are under the direction of Brenner Mortuary, 114 E. 4th St, Pittsburg, KS 66762. As published in the Atchison Globe.